Garage doors are large mechanical equipment that provides safety and security to your home. However, like any other things, they could malfunction due to varying reasons, including natural wear and tear. It’s important to learn about the common problems that you may face with your door and their possible causes so you have an idea what’s happening to your door and if it needs immediate garage door service. If you use a door opener, clicking the remote would automatically open or close the door. If this doesn’t work, the battery may need to be replaced. If you replaced the battery and the same thing happens, check if the switch that powers the opener is on. Make sure that there’s no obstruction on the sensors as well. This can be caused by a broken garage door spring or cable. Make a visual check and if you determine that there’s a broken cable or spring, don’t attempt to fix it as this can cause serious injury if you’re not trained properly for such a job. Garage door repair South Gate specializes in these matters and other garage door concerns, so call them for assistance. Loud noises when opening and closing the door can be annoying and this may be caused by dirt on the tracks. Maybe accumulating grime and dirt ought to be cleaned regularly. Moreover, the tracks and other parts of the door may also need lubrication to move smoothly again. Like with a noisy door, a dirty track may also cause uneven movement on the door. So cleaning the track could do the trick. However, this may also be caused by an unbalanced spring or broken cable. As mentioned, matters like these should not be tried as DIY projects as they can cause serious injuries. Lubricating the tracks and rollers is usually what is required for this type of situation. Springs and cables should also have the same length. This usually requires adjustment on the close limit switch. If you don’t know how to do this, you can always ask for help. 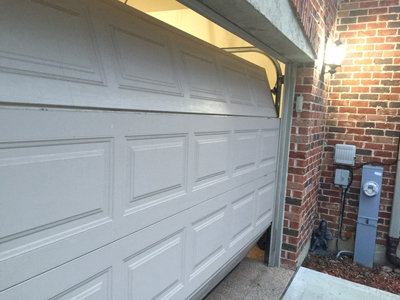 These are just some of the issues that you could possibly encounter with your garage door. Never try to fix serious concerns on your own, especially if you’re not trained to do so to prevent hurting yourself, as well as making the problem worse.